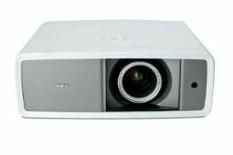 Sanyo may not feature regularly in the minds of tech fans, but the company makes some seriously good projectors at some very reasonable prices. The PLV-Z700 is the perfect example – an unassuming, £1100 unit that impressed so much it was a winner in our 2009 Awards. Now here's the replacement, unsurprisingly the PLV-Z800. You might actually struggle to tell it apart from its predecessor: both boast twin HDMI and twin component inputs, and both have a claimed brightness of 1200 ANSI lumens and contrast ration of 10,000:1. They even look the same. In fact, the only real difference is that the ‘Z800 consumes just 0.3W of power on standby, rather than the 1.1W its greedy predecessor gobbled down. Now while that may not sound particularly exciting, being remarkable similar to the ‘Z700 is no bad thing. For a start, this is an astonishingly simple product to install, with manual lens controls that are as flexible as they are easy to use. And once it's in position, the picture this Sanyo produces is superb. True, at this sort of money you're not going to get a projector with astonishingly deep blacks, but play Where the Wild Things Are and the overall image is one with great definition, terrifically balanced, neutral colours and smooth motion. Add very quiet and relatively cool running, and there's really no better-value way to get a 300in Full HD picture at home.